The Stone Sky is the culmination of the best fantasy trilogy written today and that might be an understatement. 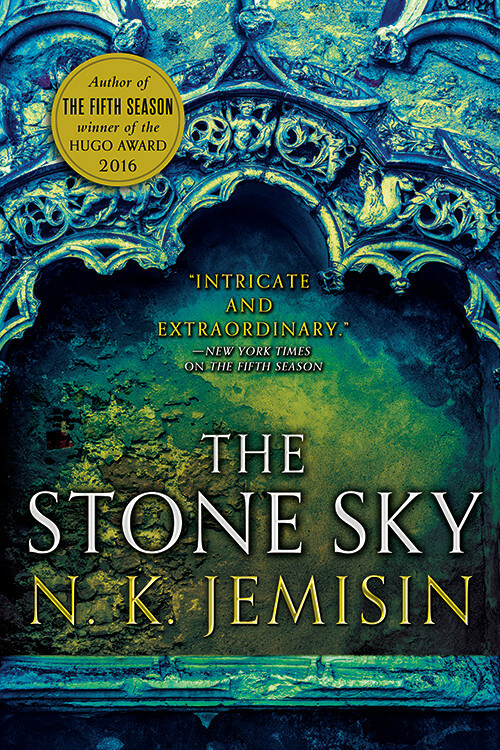 The Stone Sky is a novel in conversation with the two Hugo Award winning novels which precede it, it is a novel in conversation the fantasy genre as a whole, and it is a novel in conversation with the culture in which it was written. That's a lot for one novel to take on, but N.K. Jemisin is more than up to the task. The first two volumes of The Broken Earth trilogy set the bar so incredibly high that it would take a remarkable novel to even approach that level, let alone meet it. The Fifth Season and The Obelisk Gate were masterworks. Jemisin has set an impossible standard for herself, but her control in telling one unified story shows off the skill of an author at the height of her powers. The Stone Sky more than lives up to the promise and standard of those first two Broken Earth novels. Each novel in The Broken Earth requires a moment of centering, a moment to process and figure what sort of story Jemisin is telling - because even though this it truly a cohesive whole, each novel has its own distinct and tight focus setting it apart. "Imprisonment of orogenes was never the only option for ensuring the safety of society." I pause deliberately, and she blinks, perhaps remembering that orogene parents are perfectly capable of raising orogene children without disaster. "Lynching was never the only option. The nodes were never the only option. All of these were choices. Different choices have always been possible." When I wrote that The Stone Sky is a novel in conversation with the culture in which it was written, I did so will the full understanding and recognition that I may not be the most appropriate commentator for this. Jemisin is writing about race and power and privilege; I'm an upper middle class white male. It's not that I do not get to have thoughts and opinions about this, but my understanding of the systematic oppression Jemisin is writing about is necessarily limited. The Stone Sky is a novel about the consequences of oppression, about how a utopia is built on the backs of a persecuted race and a persecuted class. Utopia for whom, is a great question. Even mentioning utopia in commentary on The Stone Sky is absurdity because readers at all familiar with the first two novels of the trilogy know there is no utopia here. There is nothing close to a utopia in The Broken Earth. Like The Obelisk Gate, the primary viewpoint characters of The Stone Sky are Essun, her daughter Nassun, and the stone eater Hoa. Hoa, we find out in The Obelisk Gate, was the narrator not only of his own chapters (it is a while before we know this), but also is the one telling Essun's story. This was incredibly important because, even though I didn't question it for far too long, who was telling the story mattered and it changed the shape of the narrative I thought I was reading. In The Stone Sky we learn early on that Hoa is, remarkably, more than forty thousand years old and has memories stretching all the way back to before there were cataclysmic Seasons. Through Hoa's first person narration we discover the utopian continent spanning city of Syl Anagist. Syl Anagist is, in just a handful of chapters, one of the great cities of speculative fiction. It is a city of wonder and amazing technological developments. It is on the cusp of moving to a post scarcity economy. It is also built on the back of genocide and persecution and oppression and manufactured hatred. Perhaps it began with whispers that white Niess irises gave them poor eyesight and perverse inclinations, and that split Niess tongues could not speak truth. That sort of sneering happens, cultural bullying, but things got worse. It became easy for scholars to build reputations and careers around the notion that Niess sessapinae were fundamentally different, somehow - more sensitive, more active, less controlled, less civilized - and this was the source of their magical peculiarity. This was what made them not the same kind of human as everyone else. Eventually: not as human as everyone else. Finally: not human at all. It is all too real and fresh. It is reminiscent of recent world history and of the tendrils of a rotten past still rolling through America's present. While The Stone Sky is not necessarily about directly engaging with American history, readers can't help but bring that knowledge and background into the narrative. I may be putting too fine of a point on this aspect of The Stone Sky and ultimately I think the corollary to the real world is subtext, though perhaps very pointed subtext. Throughout the story, Jemisin offers an examination and a condemnation of how the privileged and powerful treat those deemed "other", especially when that prejudicial classism and racism and prejudice just happens to protect their own power and position. That's the story of the fall of Syl Anagist and throughout The Stone Sky we see how that fall resonates and directly impacts the stories of Essun and Nassun. Don't worry, I didn't forget about Essun and Nassun. As she has done with every other aspect of The Broken Earth, Jemisin completely nails the parallel stories of mother and daughter. Following the destruction of Essun's temporary refuge, the Castrima comm which very effectively showed a way for orogenes and to live in harmony with "regular" humans, Essun is on the move with the remnants of the comm looking for a new home offering safety during the Season. After the events of The Obelisk Gate, Essun is much like her mentor Alabaster was - she overextended the use of her powers and now additional use of orogeny will cause her to more rapidly turn to stone. The problem is that she can't just follow Castrima and not use her power because Essun's true goal is to find her daughter and, oh yeah, pull the moon back into proper orbit with the planet. When we say that "the world has ended", remember - it is usually a lie. The planet is just fine. Nassun, on the other hand, is hell bent on using her prodigious power to destroy the world Essun is hoping to save. She is only ten years old but has experienced pain and loss and horror the likes of which can scarcely be comprehended, and she's got the righteous and focused anger of a child and the raw power to do something about it. As with so much of The Broken Earth, the stories of Essun and Nassun are as wrenching and compelling as anything in fiction today. While perhaps nothing in The Stone Sky is as brutal as that scene in The Fifth Season where Syenite kills her own child rather than allow the Fulcrum take him and enslave him and use him up to feed the nodes stabilizing the Stillness, the revealed origin story of the orogenes is filled with equal amounts of pain and horror that calls complicit all those who benefit from the oppression of others and do nothing to alleviate that oppression and suffering. The world is broken and you can fix it; that's what Alabaster and Lerna both charged you to do. Castrima is more reason for you to do it, not less. And it's tie you stopped being a coward, too, and went to find Nassun. Even if she hates you. Even if you left her to face a terrible world alone. Even if you are the worst mother in the world . . . you did your best. Essun is one of the remarkable and notable characters in fantasy literature. She has endured so much, suffered so much, and she has come out still pushing to make a world better for her daughter. She's not a hero, at least not in the generic epic fantasy sense of the world. Essun is a woman with incredible power and though the whole world is not her responsibility, her daughter is. Even as impossibly difficult Essun's life has become (again) and how impossible the Season has made long term survival, the focus never gets too far away from Essun finding a way to find Nassun. Normally we would say "rescue" Nassun, especially given that her daughter is only ten years old, but Nassun comes across as so preternaturally assured and powerful that it's so easy to forget she's so young. She is running a parallel course with Essun because the nexus of power Essun needs to pull the moon back into course correction with the world is the same nexus Nassun needs to finish the work of the emergent Season. The Stone Sky caps off a stunning epic fantasy trilogy, one which began with the threaded narrative of three orogenes and concludes with the story of a woman and daughter finally coming back together. If you think there's going to be a truly happy ending, you haven't been paying attention. That's not the story N. K. Jemisin is telling here. The Stone Sky weaves deep personal drama and trauma with the overarching racial commentary that underpinned the entire trilogy. The Broken Earth is a monumental achievement in fantasy fiction. The Stone Sky is the culmination of the best fantasy trilogy written today and that might be an understatement.